Having earned a CAP “Certificat d’Aptitude Professionnelle” in Boulangerie, Chef Hoël went about learning his craft in different companies: The Parfait and Harrod’s in London, Le Corail Orsini in Corsica, l’Auberge du Port in Bandol, la Sauvageonne in Megève and the Relais Châteaux des Vaux-de-Cernay in the Parisian region. Chef Hoël continued his career internationally, firstly in the Bermudas at The Hamilton Princess, a five star hotel, and finally in Amsterdam with The Grand Westin Demeure, another five star hotel. In 2002, Chef Hoël took over a bakery and pastry shop in northern France. At the same time, he earned a “diplôme d’artisan boulanger” from the Crafts Guild of Lille (Chambre des Métiers). He thus ran his own company for six years, employing four staff including one apprentice. 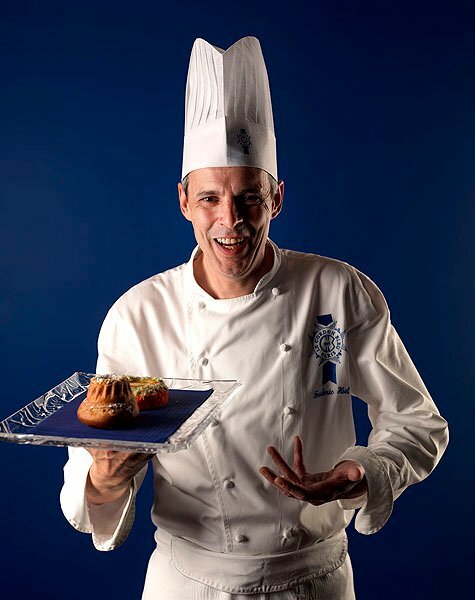 In 2008, Chef Hoël sold his business and resumed his Bakery and Pastry Chef activities in Belgium. From 2010 on, he decided to pursue a teaching career, as well as undertaking studies in specialized pedagogical training for instructors at the IPEPSHO in Tournai, Belgium. For six years, Chef Hoël taught bakery, pastry and chocolate making at the Val-Itma School in Tournai, Belgium. In 2014, Chef Hoël also gave theory and practical classes to adult students and apprentices, in Valenciennes, France. Chef Hoël has taken part in the Coupe Louis Lesaffre contest, a world championship for Boulangerie, which is held every four years, since 2004. Chef Hoël joined Le Cordon Bleu Paris team of Chef Instructors in 2016.